Lil practicing Forward Focus with choices. 1) Can you look where I’m looking…and pointing with my body language vs. look at the obstacle I’m standing closest to, or behind, even if that obstacle is a tunnel? 2) Can you perform 180 turns away from me and a tunnel, and run through a sequence of hoops behind you, with me standing next to or behind the tunnel? Lil and Jake answered YES to all the challenges I presented them with. I think Australian Terriers are exceptionally smart but I also think dogs naturally look where we are looking (and where we are pointing towards with body language) so it’s just a matter of rewarding their natural response to look where we are looking enough times to be able to then use Forward Focus to enhance the performance of what many would call “challenging” behaviors. An added benefit of practicing Forward Focus with choices might be for dogs who like to decide for themselves what the opening sequence is vs. waiting for their handlers to show them the correct opener. I suppose another benefit could be for dogs who self-release as soon as they focus on what they think is the first obstacle. Regardless of those benefits, I see this game as another fun way to reinforce solid Start Line Stays while upping the ante in new and unexpected ways. I Want a Do Over ! 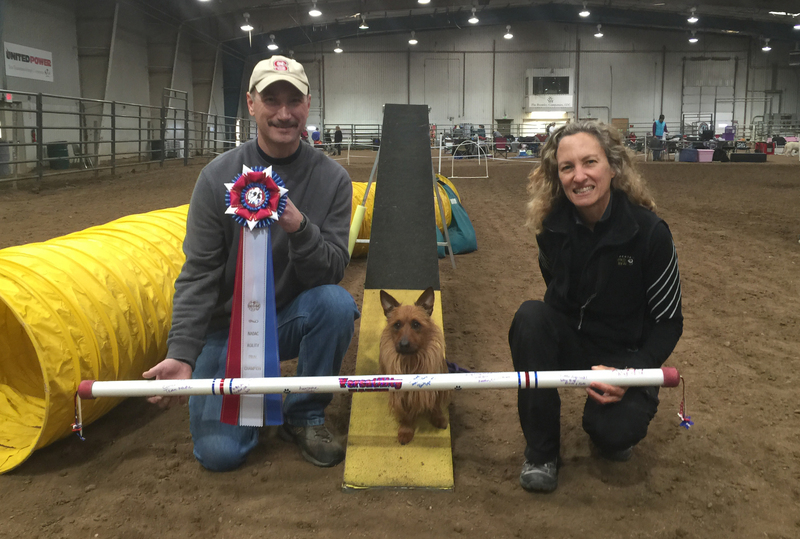 Jake, Lil and I attended our first trial in Colorado last weekend, hosted by “Dog Agility of the Pikes Peak Region” (DAPPR). The site was gorgeous and everyone was so nice and friendly, it made for a very fun weekend. I think this might be the first time I attended a trial with “real” grass vs. what we call grass in the NE.. which is more like cut grass-like weeds. Plus this was the thickest grass I’ve even seen. Lil had to really work to plow through it, which slowed her down quite a bit (as evidenced by her YPS) but that didn’t seem to dampen her spirits too much. Lil ran a whopping 14 courses, and attempted 4 bonus boxes. No Bonus Qs but she ran very well all three days Q-ing 9 of 10 non-bonus runs. Jake also had a great weekend. He Q-ed 6 out of 9 runs but more importantly his start line stays were impeccable. I had really let them slide over the past couple of years (for no good reason) and decided a few months ago to get Jake’s SLS back on track. Sharon Nelson demonstrated a fantastic Start Line Stay game at her Distance Seminar at Yellowstone Dog Sports in July which I now play here and there at home and last weekend I played the game before each of Jake’s runs and it worked brilliantly. I had no question that he would stay and when released he blasted off the start line. Now onto the main topic of this post: Why I want a do over. I screwed up and said OVER LEFT when I should have said OVER GO ON and blew what might have been a successful Bonus Run with Lil. Here is my excuse :)…. I was mentally and physically exhausted. Its been a long time since I ran 2 dogs at a 3 day trial.. up to 9 runs a day to boot. 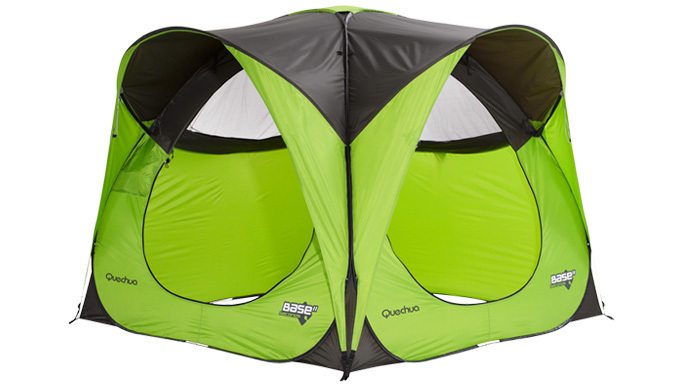 Plus the site was very large so all the treks to my tent, RV, bathrooms, ribbon tent, and 2 rings took its toll on me. But actually the “do over” I wish I had was not related to the actual run… although I would love to run that course again someday to see if we could have gotten the bonus from behind that tunnel. But my bigger wish for a do over was based on a short conversation I had immediately following that run. A fellow competitor came up to tell me that her instructor encourages her students NOT to use verbal directionals (left and right) because people make mistakes with them. My response (while having a post-run party with Lil) was “I rarely screw them up.” What I wished I had said was: “I rarely screw them up….but when I do, my dog doesn’t know I screwed up because I follow through as though everything went perfectly well. Granted I was a total bumbling idiot with my directionals in the opening sequence of this particular run, but Lil didn’t seem bothered by even this extreme level of confusion on my part, as evidenced by her confidence and speed… and this was the 2nd to the last run on day 3 so I think we were both tired. (above) the video that shows my bumbling idiot moment in the opener. At 0:40 seconds, I redeem myself re: verbal skills and Lil does a great job with what I considered to be the trickiest part of the course.. an interesting serpentine-like distance challenge. Even with an occasional mistake using LEFT and RIGHT, I think the benefits far outweigh the negatives for me and my dogs.. not that I’m suggesting everyone should use LEFT and RIGHT. I personally love that there are as many different ways of handling as there are different types of handlers! At Sharon Nelson’s Distance Workshop last month, I realized Lil and I had a few holes to fill re: working at big distances. One was sharp turns (pushes) away from me after the weave poles and contacts (with me at lateral distance and with a discrimination straight ahead). With Champs coming up, I decided it would be fun…. and worthwhile to fill the training holes I am aware of, knowing there are surely more holes that will appear as we attempt more and more bonus boxes down the road. Since I don’t have access to contacts right now, I decided to start by working on sharp turns away from me after the weave poles. On a side note, my weave poles (Versa-Weaves) allow me to leave a slightly open channel so I can do more reps than I would with straight-up poles. I also only used 6 vs. 12 poles because the focus of this session was on exits and not weaving itself. 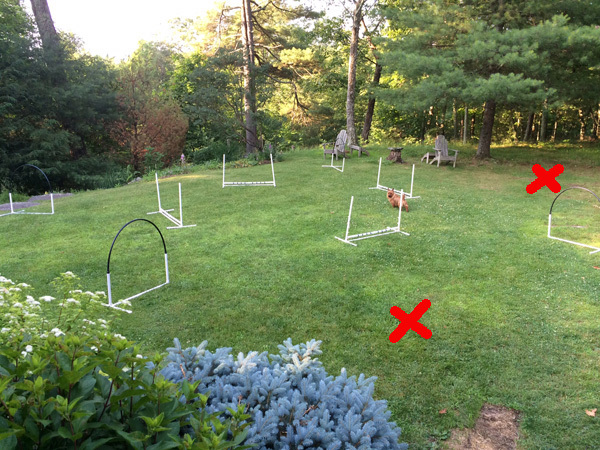 I was (and am) very pleased with how well both dogs responded to pushes after the poles to the far hoops. I can see room for improvement with my timing but one thing I noticed with Lil is I can say WEAVE RIGHT or LEFT before she enters the poles and she seems to know that I mean “weave ALL the poles and then turn right or left” and she does not pop out of the poles. I repeated RIGHT or LEFT at the moment her nose crossed the plane of the last pole so I’m not sure if she is thinking about the verbal pre-cue while she is weaving but it certainly didn’t appear to hurt.. and who knows… it might actually help her anticipate an upcoming turn. Time will tell. Jake blew me away with his enthusiasm and I loved seeing how far he was willing to drive ahead of me. His confidence is so much higher than it was even a month ago and as a result, I am asking for more and more distance. I think he is diggin’ it as much as Lil. What a GOOD BOY! One last thing…..I’m starting to do something new with both dogs when working at bigger distances. I will sometime ask for a WAIT and then redirect them to the correct path vs. always letting them run the path they are committed to running, even if it is not the path I had intended. The reason I had previously let them continue on was to instill full confidence when working away from me but at this point I think both dogs are confident enough that I can ask for an occasional WAIT and redirect when practicing skills that are within the realm of what they know or just slightly more challenging. I don’t have a strict rule about when I ask for a WAIT but I only do it occasionally since I think if I interrupted their flow too often they would become cautious when working at bigger distances. So far, so good. Both dogs appear to have great attitudes before, during, and after the occasional WAIT and redirect. Other variations were dogs taking a sharp left off DW ramp through a hoop, then taking a right turn over two jumps, then OUT around the barrel, through the far hoop, and back up the DW ramp. We also did this loop in the other direction. I triggered the MM remote so the beep occurred when dogs were committed to running around the barrel since my main goal with this set up was to build a better understanding of barrel performance with me in various positions, including standing well beyond the barrel… way out in the woods. One great reason to trial, beyond how much fun trials are, is to see which skills (both dog’s and human’s) need to be trained or brushed up on. So the issue Lil and I had with that distant barrel at our last trial made me think back to other courses we’ve run that had a barrel and I realized I should be including a barrel regularly when we practice so it is not an oddity when we encounter one on a course. Incidentally, in NADAC a judge can use a barrels in place of C-shaped tunnels and barrels can also be part of official courses so its important for me to practice handling and for my dogs to practice running around barrels so I can be less-than-perfect with my handling and timing yet my dogs will still seek out a barrel like they do other obstacle. An added benefit for Jake was the last time he ran a Barrelers Course (which is kind of like barrel racing for horses), his line was perfect… it just didn’t include any barrels. 🙂 It was like we were practicing shadow handling. On a side note, Jake’s contacts were stellar today, regardless of my position. The last time I tried standing 20′ away, he BOINGED. But today, every rep was perfect, even when I was standing WAY out in the woods beyond the barrel. Lil’s DW performance was also spectacular today and she had no trouble at all with me directing her through the correct hoop from every possible position in the yard. Had either dog not been able to meet criteria on the DW ramp, I would have had to change the set up. I’m so happy I didn’t need to because being able to leave the MM on the porch offered an added incentive for tight turns around the barrel and keeps the sessions moving quickly. Jake and Lil are definitely more fun than a barrel of monkeys. What a fabulous early morning backyard training session we had this morning. The weather was perfect and the grass was freshly mowed. The set up included one more hoop to the left and I started some reps running my dogs down the DW ramp off the set of steps to the left of the out-of-frame hoop (if this makes sense) so they entered the box at full speed. I tend to set up symmetrical sequences so I can work with dogs on my right and left without needing to reset any obstacles. 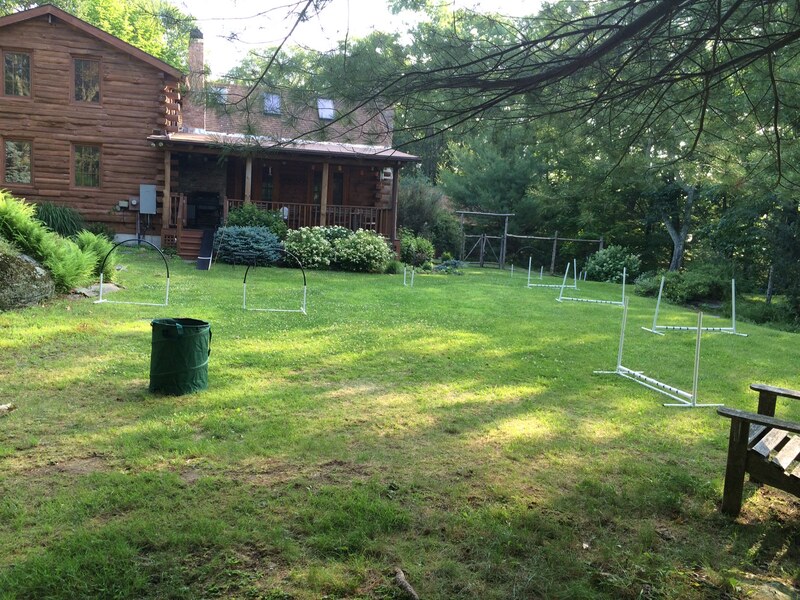 I really liked this particular set up for testing how well my dogs respond to my body language (upper and lower body cues) for GO ONs, LEFT and RIGHT turns by using a box consisting of 4 jumps surrounded by hoops. I stayed well outside of the box (at positions like the 2 red Xs) in order to test distance skills while layering other obstacles. Boxes sure are great for proofing handling at a distance since they provide very tempting off course options. Lil totally aced the GO ONs through the box…..super fast, 100% confident, and not even a tiny glance at the off course obstacles. Lil’s OUT skills (turning away from me) were also stellar. The only skill we/ I did not ace the first rep was OVER RIGHT (turning towards me) when I just used a dramatic shoulder pull. So the next rep, as Lil approached the first jump in the box, I took a couple of small steps backwards while rotating my upper body and feet to face the path ahead and she totally GOT that I wanted her to turn towards me…. and she did it at full speed and with 100% confidence. No question about it. I also did some reps sending her through the 4 hoops around the perimeter of the box while I took just a single step to push on her line when needed (along with appropriate body rotation). That was quite challenging since 3 of the hoops were quite close to the edges of the yard but Lil GOT all 4 of them after a couple of tries. Jake was also super fast, confident, and aced the GO ONs but when I send him ahead, he tends to think he knows the course based on whatever he did the last rep. He had a blast and so did I but since I don’t plan to do BIG distances with Jake at trials… I am not worried about his creativity 🙂 when I am not using motion (running with him) as my primary cue! Jake is such a fun dog to run! Compared to just one month ago, I feel so much clearer about how to best use physical body cues for distance handling thanks to the ongoing guidance and feedback from my good friend Lynn Smitley. 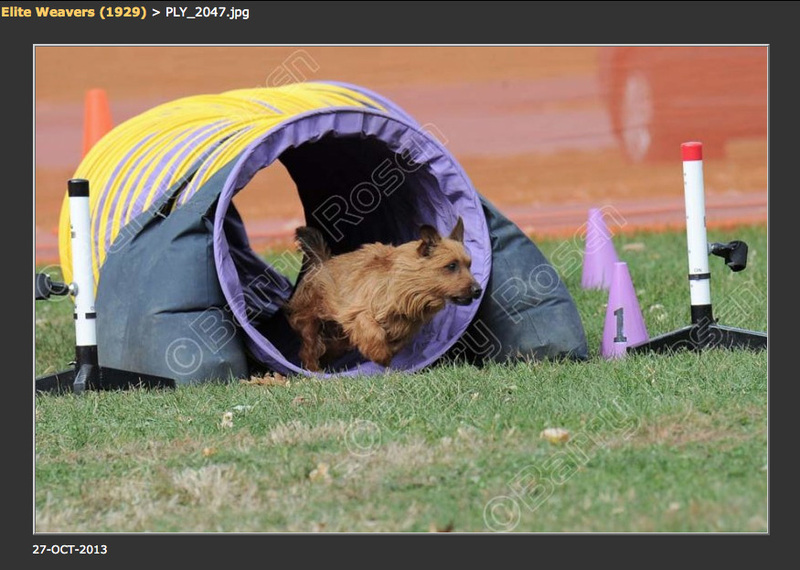 She showed me my NEW backing-up “dance move” at our last trial and it worked perfectly to turn Lil towards me off a beckoning tunnel straight ahead which was part of the distance challenge in an Elite Chances course, which Lil aced. This cue is so effective it has to be a natural cue for dogs. Today’s session seemed to confirm that. Below is a link to a video of Lil’s 2nd and 3rd ever BONUS BOX attempts and the Elite Chances run I referred to.